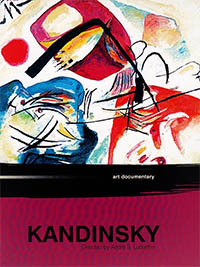 Documental sobre Kandinsky, pionero del arte abstracto. Synopsis: Colour, form, area - this is the formula of the greatest pioneer of abstract painting. Kandinsky came to art late in life, but his impact through Der Blaue Reiter (The Blue Rider) and Bauhaus paved the way for modern art. In 1913, he created one of the first abstract pictures, the theoretical basis of which was inspired by his essay Über das Geistige in der Kunst (On the Spiritual in Art). Accompanied by Mussorgsky's Pictures From An Exhibition, Labarthe goes on a sensual journey which makes the soul resound with colours and forms.